I’m still working on my one year blogaversary post. I was going to hastily put it together due to my current insane workload, but changed my mind. There are soooo many things I have learned this year that I don’t want to short change that lovely anniversary and then regret it. So instead, I will try to catch up on some blog posts sitting in the wings as I work on it. I didn’t have any fancy white chocolate to use for this recipe, just the white chocolate baker’s squares. 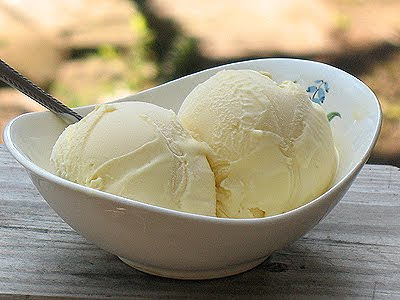 They worked out beautifully and if you like white chocolate you will like this ice cream! 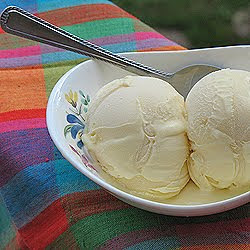 The book suggests topping this with Sour Cherries in syrup (on page 185 of his book ) or pairing it with chocolate cake. I say it’s fabulous all by its lonesome! I think I’ve mentioned before that I have learned to gather all my ingredients ahead of time. Saves time while making the recipe and it also saves you the disappointment of discovering that you thought you had something on hand when in fact you were out. :-p As you can see, my egg yolks are in a plastic sandwich bag. 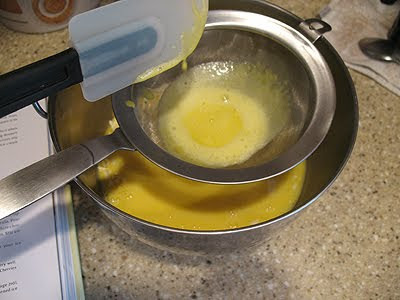 The most efficient way to extract those yolks from that bag is to cut off a bottom corner and squeeze them out. 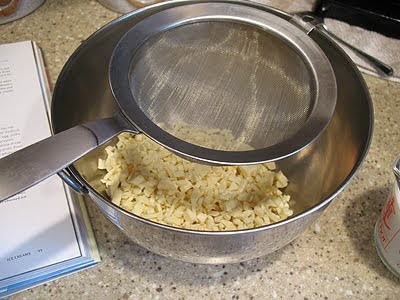 Start by putting all the chopped white chocolate into a bowl and place a mesh strainer over the top. Set that aside. 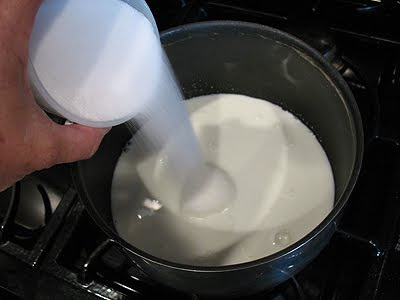 Mix the sugar, salt and milk together and warm in a saucepan. 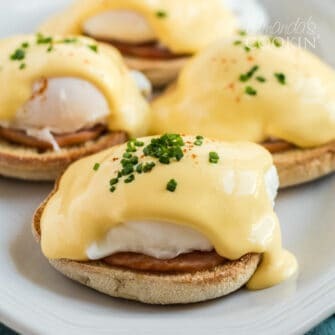 After you’ve whisked the egg yolks in a separate bowl, temper the eggs by adding a very slow drizzle of the warm mixture into the yolks, whisking constantly. 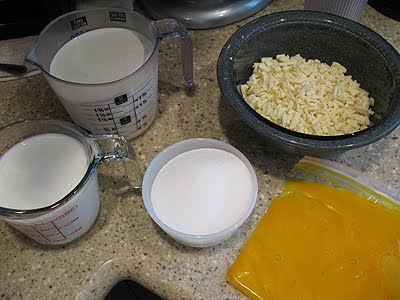 You can increase the drizzle after you’ve added about 1/4-1/3 of the warm milk mixture. Put the warm egg mixture back into the saucepan. 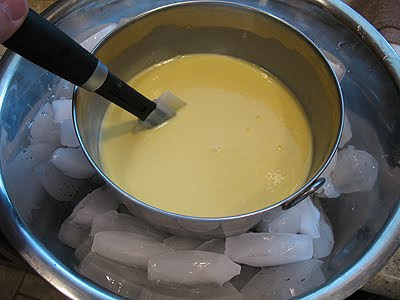 After cooking the mixture and thickening it to a custard, strain it over the white chocolate. I had to stir for quite a while to get all the white chocolate to finally melt. Next, stir in the cream. Then put the bowl into an ice bath and stir until cooled. 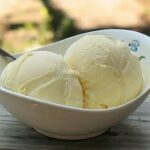 White chocolate fans will adore this creamy white chocolate ice cream. Stir the mixture constantly over medium heat with a heatproof spatula, scraping the bottom as you stir, until the mixture thickens and coats the spatula. 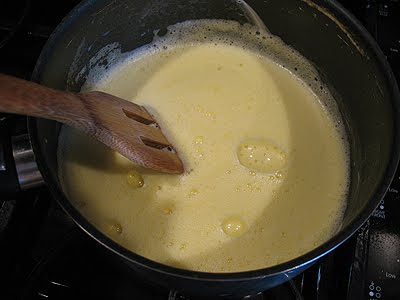 Pour the custard through the strainer over the white chocolate. 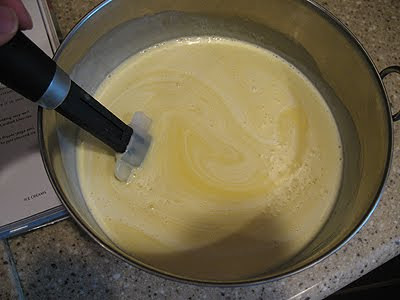 Stir until white chocolate is completely melted and the mixture is smooth, then stir in the cream. Stir until cool over an ice bath. If you don’t have a ice cream maker can you put in the freezer? Hi Belinda. You can, but if you do that I would stir it every half hour or so to help it along, until it gets to the point where it can’t be stirred any longer. It will probably need to freeze over night. 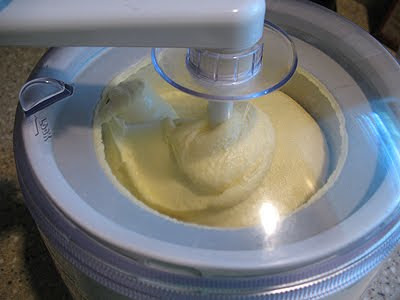 The churning in the ice cream maker helps to keep the ice cream homogenous so that ingredients don’t settle and freeze separately.